We come to you this time with an invitation. It is an invitation to pray with us during a novena of Masses being offered from September 7-15. The intention for these Masses involves no petition. We are asking no favor for ourselves or for anyone. We are having this novena of Masses offered in reparation to the Sorrowful and Immaculate Heart of Mary. When we look at the world, how can we deny that it is filled with trouble and sorrow? Many nations at war, many others facing economic collapse, and worse, moral collapse. The forces of good and evil are in the age-old battle. God and His Mother are not remote observers and bystanders in this battle. From Heaven they see and know the hearts of all their children. Many serve lovingly, but others offend. It is for these offenses that we offer our prayers of reparation, returning love for love. Please join us, won’t you? Since Our Blessed Mother’s favorite prayer is her rosary, perhaps you could share in this novena by offering your daily rosary for this important intention, this proof of our love for our tender and mighty Mother in Heaven! We also present a wonderful Consecration to the Sorrowful and Immaculate Heart of Mary you may wish to include in your prayers. Perhaps some of you are familiar with an ancient Catholic custom of keeping “Our Lady’s 30 Days”. These are the thirty days between two important feastdays in honor of the Blessed Virgin Mary: August 15, her Assumption into Heaven, and September 15, her Seven Sorrows. It is believed that during these days, Our Lady bestows many graces from God to her children – special graces of protection, prosperity, light and joy. Farmers were blessed with abundant crops during this time of harvest, sicknesses were alleviated, prayers for protection during storms were sometimes miraculously answered, and usually, the weather proved mild and clement during her “30 Days”. Those especially devoted to her experience a special peace and joy. Providentially, one day after we had arranged for the Novena of Masses, when we were going through some old holy cards and religious pamphlets, our Prioress came upon an old, dog-eared blue leaflet which none of us remember having seen before. It gave the instructions for a chaplet. And would you believe? The chaplet was in honor of the Sorrowful and Immaculate Heart of Mary. It is a simple chaplet, commemorating the joys, sorrows, and glories of Mary. It didn’t take us long to decide that Our Lady would be pleased if we added this chaplet to the selection on our web site. The prayers are lovely and meditative, and we think its recitation will glorify God in His Mother! We also have a new booklet on the site called Devotion to the Sorrowful Mother, which presents the Church’s teachings about Our Lady’s Seven Sorrows and gives beautiful prayers in her honor. Learn why she is called “Queen of Martyrs”. We are at last moved completely into our new building and enjoying its peace and quiet. Nice to have all the workmen no longer under foot! They finally brought the one missing doorknob, which has been the daily joke for three months now! Please thank with us Our Lord and St. Joseph, our loving Protectors for this important project. And of course, we again thank all of you who have assisted us with the expenses of this building, and continue to do so. Lastly, please remember in your good prayers the vocations who, please God, will join us in the next few months. 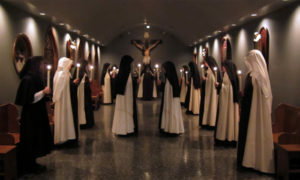 One of the most frequently requested suggestions for our newsletter is that we share the stories of the vocations of the Sisters. The vocation to Carmel is one that seeks to be hidden and unknown, so we hesitate to give biographies, as such. Even so, we can and will try to share with the Friends of Carmel certain anecdotes and aspects of our vocation and life. Since we dedicate this Newsletter to Our Lady, we thought it might interest you to know how her gracious and loving presence in our lives greatly influenced our path in life. Not one of us can say that our Blessed Mother did not have a direct part in her Carmelite vocation. One Sister says, “I received my vocation from Our Lady’s hands while praying at the shrine of Our Lady of Good Help.” This shrine is in Robinsonville, WI and is, as far as Sister knows, the only formally Church-approved apparition in the United States. It has enjoyed the bishop’s approbation since the late 1800s when Our Lady appeared to Adele Brice there, in the farmlands of Wisconsin. Another of our Sisters made the Pilgrimage of Our Lady of Chartres in France. Her experience on that long, difficult and prayerful journey secured her to God’s service in Carmel. One of our Sisters is a convert to the Catholic Faith, and we all rejoiced when she chose Mary for her baptismal name. It takes time for many converts to “warm” to Our Lady; to know her to be not an obstacle to God, but the most direct way to finding and knowing Him! Another Sister found herself attracted to Our Lady of Guadalupe and was thrilled to make a pilgrimage to her shrine in Mexico shortly before entering Carmel. Please know of our continued and grateful prayers for you. May you all receive the blessings God wills to bestow through His Mother during “Our Lady’s 30 days”!